It seems I've been everywhere recently except Nebraska! 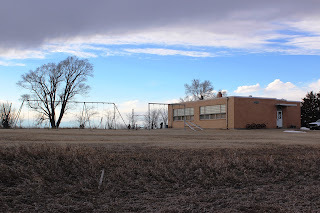 I've posted essays from Denver, Oklahoma City, Great Bend Kansas and Seattle. It's about time I shared a little from the great state of Nebraska again. 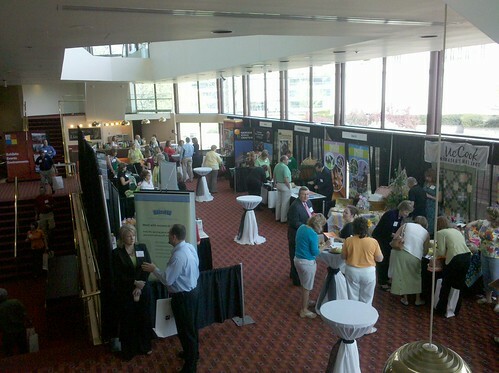 A few weeks ago, Nebraska's tourism professionals gathered in Lincoln to host a reception for meeting planners whom each of us hope will choose our locations for their meetings. 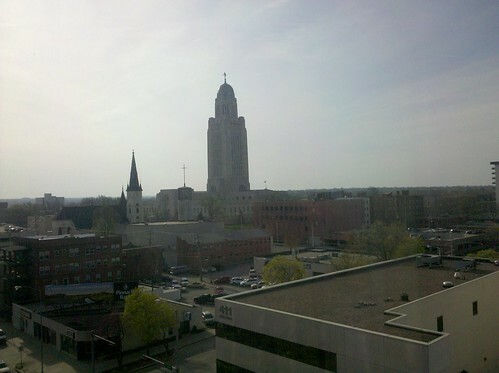 My room at the Cornhusker Marriott was great, overlooking Nebraska's historic Capital. The most wonderful thing about all of us getting together is that we get to catch up on what's happening in our respective communities, what's new, and what we might like to visit ourselves. Oh, and we do some work recruiting meeting planners! Even though this spring has never seemed like it will finally make the transition from March weather to May weather, the theme was "Spring Fling". 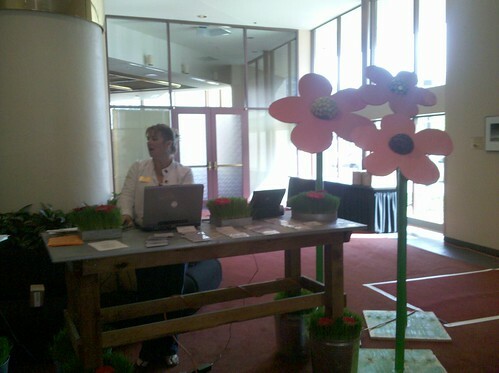 All of the booths had a spring time decorations. 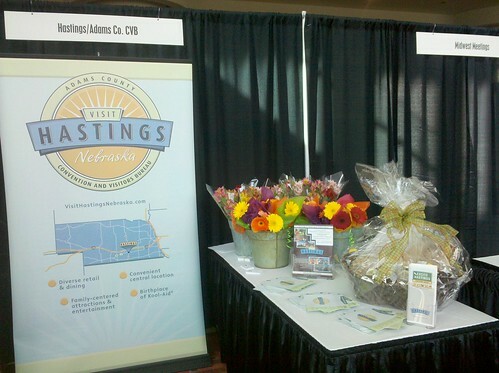 Hastings Nebraska gave away these beautiful daisies. Hastings has really embraced Festivals as their communitys draw, and they've really done it right. It all started with the major Kool-Aid Days in August which will be celebrating 13 years this August 13 through 15. If there's even the tiniest memory of childhood within you, you will have a blast at Kool-Aid Days. Now Hastings boasts "Summer in the City" June 18 through 24, a week of great activities bookended by the Cottonwood Festival the first weekend and the Flatwater Folk Festival on the second weekend. If you love art, music, entertainment set amid great small town atmosphere, then this week in Hastings is for you. 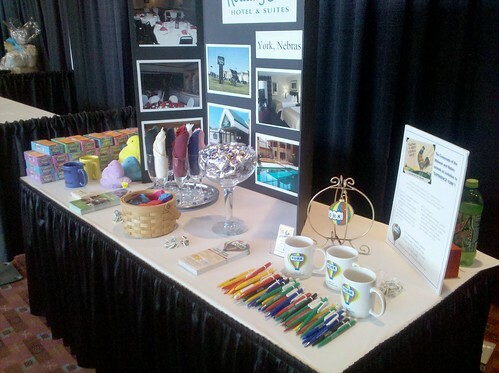 York is another community that just revels in bringing new and fun events to the fore. 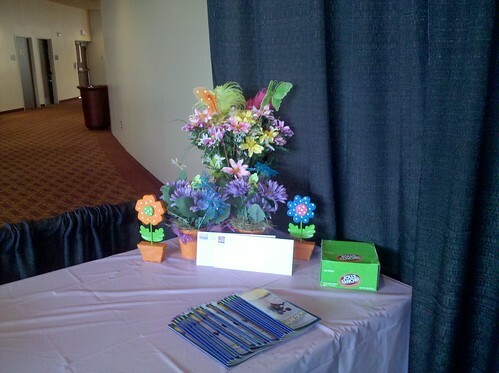 As home to Nebraska's "Peep Show", spring decorating was easy for them. So just what does a Peep show in Nebraska look like? Imagine an auditorium filled with dioramas created from the fluffy marshmallow creations (Thank goodness, because when I Googled "Peep Show" for this blog post, I came up with lots of stuff that was entirely different!!). York takes their kooky and quirky seriously, recently adding a National Scream contest to their schedule of events during Halloween. Add to that a million-dollar marble museum, and you truly have a unique place to visit. Norfolk didn't skimp on the spring flowers either, and they work hard to bring you great entertainment too. Ever heard of Johnny Carson? He called Norfolk home, and they have developed the Great American Comedy Festival to honor his legacy (and to bring a lot of fun and great entertainment to town). 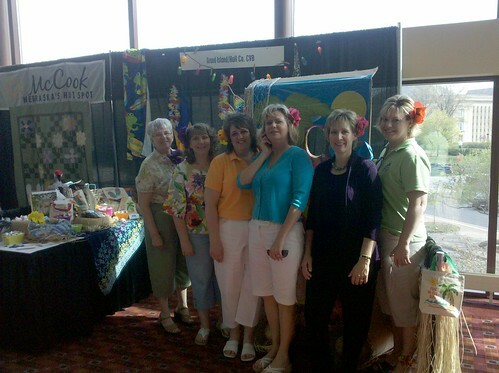 It's coming up quickly on June 16-20, so check out their website and make plans to attend FAST! Out west, our friends from Sidney are shaking off the winter cabin fever as well (too bad they just got a few more inches of snow in mid-May!). However, they are long-time Nebraskans, and they know that those long hot days of summer will eventually come! Sidney and the outdoors are nearly synonymous, as home to the original Cabelas store. Who can plan outdoor fun without Cabelas? 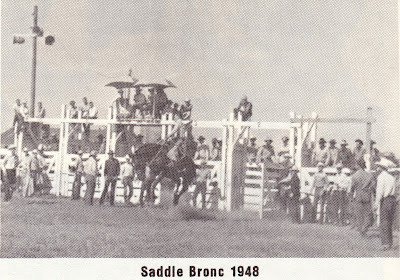 Sidney will also soon be home to the National Pony Express Monument, scheduled for dedication on June 18, during the re-ride celebrating the 150th anniversary of the Pony Express. Nearby, Scottsbluff and Gering showcase their spectacular scenery just now beginning to show the green tinges of the coming spring. Collectively known as "Nebraska's Landmark Country," our ancestors traveling west on any of the major trails mention most often in their diaries the landmarks found in this area. One of the most widely celebrated rites of spring time is Arbor Day, which started in Nebraska at Arbor Lodge in Nebraska City. 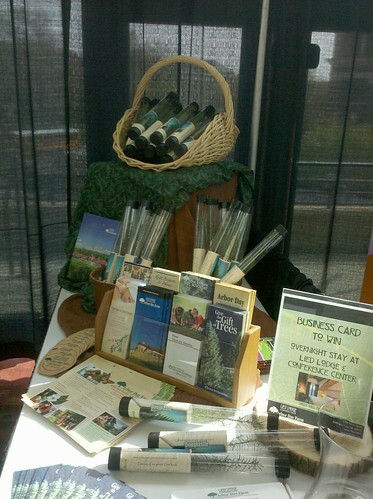 The Lied Lodge and Conference Center keeps the tradition alive by distributing tiny seedling trees. You'll all know how much I appreciated finding out about this next entry! Did you know there is now a distillery in Nebraska making Vodka! Wow! First great wineries, then wonderful craft breweries, and now VODKA! The Coopers Chase Distillery in West Point is Nebraska's first federally licensed distillery (about time!). 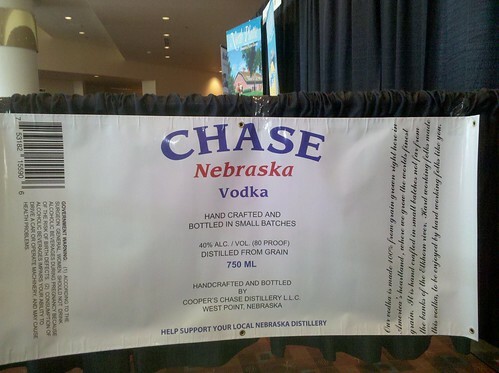 The Chase Nebraska Vodka won a bronze medal in the 2010 San Francisco World Spirits Competition. I'm chagrined to say I haven't tried it yet, but you can be assured it's on my list! Beautiful McCook, located just seventy-five miles south of my working headquarters of North Platte is definitely Nebraska's hot spot - literally! 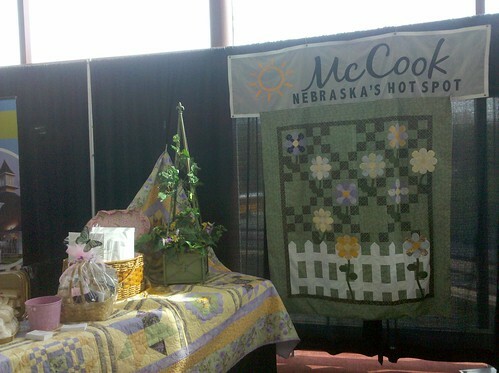 Throughout the summer, McCook boasts more record high temperatures than any other location in the state. Thank goodness there are plenty of local lakes in the area to cool off in. For more cool-weather activities, McCook is right in the middle of the best Pheasant hunting in Nebraska! 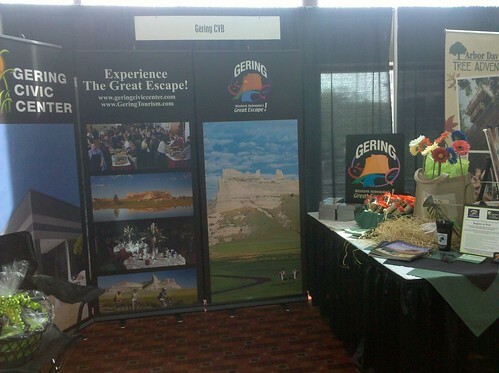 I don't even know how my friends from Grand Island had time to put together and staff this cute booth. The Nebraska State Fair is moving to Grand Island for the first time this fall. When most states undertake to move their state fair, they plan for decades to do it. Nebraska is doing it in a year! When this picture was taken, we were all just recovering from the influx of tourists coming to see the annual spring Sandhill Crane migration, and Grand Island is especially busy with tours for that spectacular event. As you can see, the event accomplished its goal - showcasing our great Nebraska communities and giving our guests an opportunity to visit. Dare I say I almost forgot? Or how about I saved the best for last? 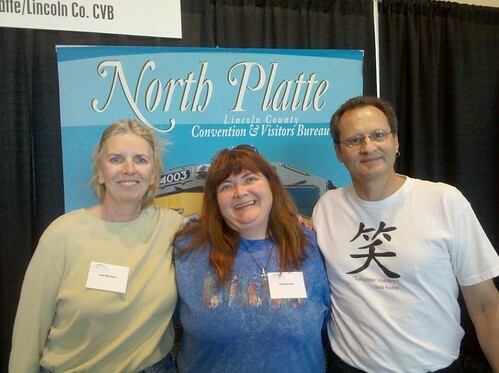 North Platte of course was well represented by our CVB staff and representatives from our Holiday Inn Express Conference Center and our Quality Inn and Suites Sandhills Convention Center. We even had some celebrity guests stop by our booth. Humorists Juli Burney (or Comedy Goddess as she likes to be called), Kent Rader and Jan McInnis stop by to invite everyone to an event at the Lincoln Community Playhouse. 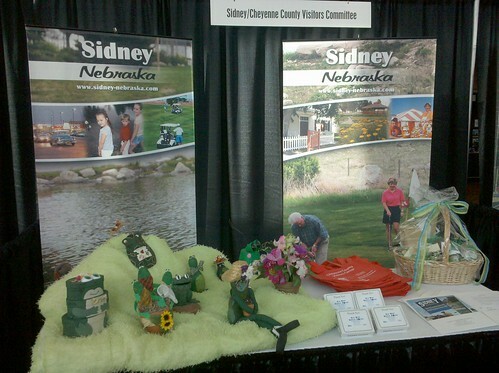 Not only does North Platte have wonderful attractions, exciting events and beautiful scenery, we also have two of the most excellent convention, conference and meeting sites in Nebraska!